I read about a dog tracking device called Retriever over the weekend in Track Your Dog With Retriever, The Compact GPS Dog Collar. There is nothing particularly innovative in this idea, but it seems to be well executed. It interests me :) However, I must confess that I am wondering if it could equally well be used on a child! Actually, I would be very interested in a generic version that I could hide in a car, or hide in a school bag, or in any other concealed area! I read yesterday that an Irish company called Cauwill Technologies won the Best Emerging Company category in the 2009 Seedcorn Business Competition. For more about the winners see Intertradeireland Seedcorn Competition Announces Winners. Cauwill Technologies develop GPS based solutions for use with LBSs. A friend recently made me aware of a new child locating service called num8 by a company called Lok8u. 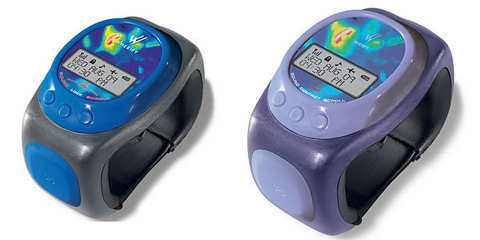 The service is delivered using a child-friendly watch that contains a GPS receiver, and it uses Google Maps to display the child’s location. Now available.. the world’s first GPS locator that locates your child…not just the device. num8 is the world’s first GPS locator device that has been specifically designed with children in mind. I am wary of these claims… For example, I think that Wherify would dispute these claims (if it was still operating)! I am sure that there are many others also! I was delighted to read that the first Galileo contracts were awarded during the week in Contracts give impetus to Galileo. There should be plenty of business opportunities for companies working in this area as the work progresses and sub-contractors are required. Galileo will be under civilian control, and the system operators will be able to provide guaranteed levels of service. This contrasts with the GPS system being under the control of the US military, and therefore it has no guaranteed levels of service. Galileo will provide more detailed location information, and its signals are more resilient. It certainly should be an interesting space in which to work in the near future! 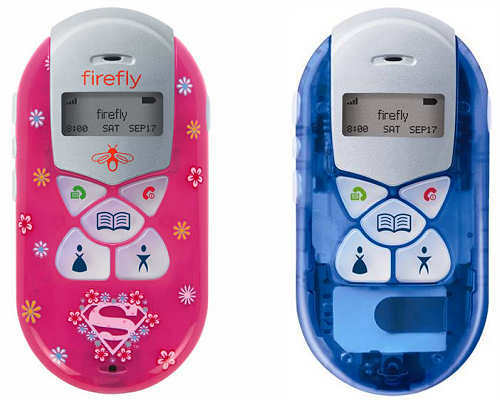 I noticed these Firefly mobile phones for sale in many main-street shops while I was doing some off-line Christmas shopping yesterday. These mobile phones are designed for young children. Typically, the user (a child) is allowed to call Mum (big button with woman) and Dad (big button with man). Additionally, the user is only allowed to receive calls from numbers that are in the address book. In terms of technology there is nothing new in these mobile phones, because they are simply very restricted mobile phones. I think that the main novelty lies in the usage of the technology to satisfy a certain market. I think that it is a great idea! I presume that there will soon be a GPS enabled Firefly that enables concerned parents to view their childrens’ locations!